Postcards From The Smokies » How Sweet It Is! Locally-grown Berries. How Sweet It Is! Locally-grown Berries. After months of commercially-grown-who-knows-where strawberries, the month of May is indeed special — we can finally enjoy the sweet taste of fresh-picked, locally-grown berries. On Friday at the Bryson City Tailgate Market, Molly Shaw treated young Abby Shuler to a bright red berry from Shelton Family Farm in Whittier. Shelton and Darnell Farms are two area growers where you can pick your own or purchase containers of freshly-picked berries. And May 15 is the date for Darnell Farms’ annual Strawberry Jam, a full day of music, crafts, hayrides and food …including strawberry shortcake. 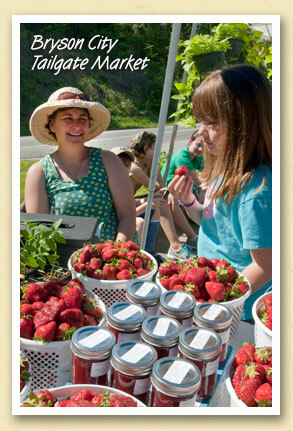 Molly Shaw is an elementary school teacher whose award-winning strawberry jam is available at the Cottage Craftsman and the Fryemont Inn. You can purchase local produce and crafts at Bryson City Tailgate Market, Fridays from 9am to 1 pm at the parking lot next to Fred’s on Highway 19 West.